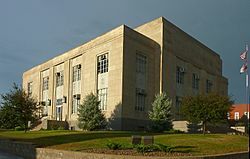 Bethany is a city in and the county seat of Harrison County, Missouri, United States. The population was 3,292 at the 2010 census. The settlement of Harrison County began around 1838, although the land was not surveyed and opened for entry until 1842. The county is named after Albert C. Harrison, a 19th-century Missouri political figure. Many of the early settlers to the area homesteaded along Sugar Creek and in the Bethany area. Three commissioners deliberated for several days to determine a site for the county seat, and voted to site it in the southern part of the county. The original name of the community was Dallas. In June 1845, John S. Allen was appointed to survey the town into lots and offer the same for sale. The plat, covering 19 acres (7.7 hectare), was completed on 27 June 1845. The name Dallas apparently did not meet with the general approval of the residents of the community and the issue was brought before the county court. It was decided that the court and county officials present would select a new name by ballot. The names of Bethany and Carthage were proposed. The vote favored "Bethany"; accordingly the town's name was changed. It was incorporated as a city by an act of the General Assembly dated 6 January 1860. The first mayor was T.H. Templeman. The first home constructed in the community was built by John S. Allen. Although built as a residence, it was primarily used to store the first stock of goods brought to the community. It was destroyed by fire in 1864. The Chicago, Burlington and Quincy Railroad reached Bethany in 1880. Two other railroad lines were also later laid into the county. The railroad influenced the economy and environment of the community until the early 1980s, when the last train pulled out of the Bethany Depot and the tracks were removed. Transportation was an important industry to the community and the population grew to its greatest level around the turn of the century when over 24,000 persons lived in Harrison County. Industry played a vital role in Bethany's growth starting with Colonel C.L. Jennings who erected the first steam mill around 1854 in the northwest part of town; it produced both lumber and flour. Because the country was so new, little need for towns existed. For several years, only a few retail shops existed and development and growth of the town was slow but by 1855, Bethany was known as one of the best trading places in Northwest Missouri. An industrial park was established in the 1960s by the Harrison County Industrial Development Authority; the Bethany Memorial Airport was opened in 1968. The first tenant in the industrial park was Calhoun Manufacturing, making agriculture machinery. Lambert Manufacturing opened a facility in 1971 and Place's Discount Stores also became a resident of the industrial park until 1999 when they sold to Pamida, with the distribution center remaining active in the park until its 2002 closure. The 120,000 square foot building was purchased by the home grown Bethany business Gumdrop Books following Pamida's closure. Later additions to the park include Superior Waste, and Tri-State Carports, which opened for business in 2001. The 1990s were a period of aggressive growth, especially within the service industry with the addition of several motels and restaurants. There has been several million dollars investment each year during the 90's and an increase of nearly 100 jobs annually. Through the years, development continued and included the construction of a lake in 1935 to serve the water needs of the community. In 1960, a second lake was added so that Bethany could meet the increasing water needs. The Harrison County Lake was completed in 1994 and provides a third source of water for the community. In 1954, residents voted to issue bonds to build a municipal swimming pool. Numerous other utilities were upgraded from 1930 to 1970 including the construction of a water tower in 1989 to serve growth along the north side of town. In 1996, residents approved a sales tax to extend water lines from the new tower to the south side of town which resulted in a looping of the system and improved water pressure for many areas. The sales tax also funded the reconstruction of Main Street from Highway 69 to the square. Transportation, which played an important role early in Bethany's history, came to play an even bigger role in the 1960s when Interstate 35 was constructed. This north-south 4-lane highway connects Canada with Mexico. The interstate ran along the east side of town and since the completion of the interstate in the early 1970s, the community's growth has been in that direction. The Hamilton House and Slatten House are listed on the National Register of Historic Places. 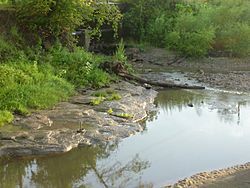 A limestone outcropping on Big Creek west of town gives its name to the Bethany Falls Limestone formation. The falls no longer exist and only a small amount of stone remains exposed. However the formation extends through Kansas City, Missouri and limestone is used extensively in buildings in that city and the formation is the basis for Subtropolis which claims to be the world's largest manmade commercial cave. The formation got its name in an 1862 study by G.C. Broadhead, who performed many of the geological surveys for Missouri at the time. Bethany is located at (40.266579, -94.034005). According to the United States Census Bureau, the city has a total area of 4.48 square miles (11.60 km2), of which, 4.44 square miles (11.50 km2) is land and 0.04 square miles (0.10 km2) is water. Bethany's climate is characterized as a humid continental climate with distinct influence from subtropical air masses in summer along with cold winters. As of the 2010 census, there were 3,292 people, 1,411 households, and 821 families residing in the city. The population density was 741.4 inhabitants per square mile (286.3/km2). There were 1,602 housing units at an average density of 360.8 per square mile (139.3/km2). The racial makeup of the city was 96.4% White, 0.5% African American, 0.5% Native American, 0.3% Asian, 0.1% Pacific Islander, 1.3% from other races, and 0.9% from two or more races. Hispanic or Latino of any race were 3.0% of the population. There were 1,411 households of which 28.3% had children under the age of 18 living with them, 43.9% were married couples living together, 11.0% had a female householder with no husband present, 3.3% had a male householder with no wife present, and 41.8% were non-families. 36.2% of all households were made up of individuals and 18.2% had someone living alone who was 65 years of age or older. The average household size was 2.23 and the average family size was 2.88. The median age in the city was 41.7 years. 23.2% of residents were under the age of 18; 9% were between the ages of 18 and 24; 21.2% were from 25 to 44; 23.6% were from 45 to 64; and 22.9% were 65 years of age or older. The gender makeup of the city was 47.8% male and 52.2% female. As of the census of 2000, there were 3,087 people, 1,344 households, and 817 families residing in the city. The population density was 696.2 people per square mile (269.1/km2). There were 1,506 housing units at an average density of 339.7 per square mile (131.3/km2). The racial makeup of the city was 99.00% White, 0.10% African American, 0.32% Native American, 0.19% Asian, 0.03% from other races, and 0.36% from two or more races. Hispanic or Latino of any race were 0.62% of the population. There were 1,344 households out of which 24.9% had children under the age of 18 living with them, 48.1% were married couples living together, 10.2% had a female householder with no husband present, and 39.2% were non-families. 35.0% of all households were made up of individuals and 20.1% had someone living alone who was 65 years of age or older. The average household size was 2.15 and the average family size was 2.74. In the city the population was spread out with 20.3% under the age of 18, 7.7% from 18 to 24, 22.2% from 25 to 44, 20.8% from 45 to 64, and 29.1% who were 65 years of age or older. The median age was 45 years. For every 100 females there were 80.3 males. For every 100 females age 18 and over, there were 73.4 males. The median income for a household in the city was $28,050, and the median income for a family was $35,023. Males had a median income of $27,250 versus $16,983 for females. The per capita income for the city was $15,189. About 9.5% of families and 13.0% of the population were below the poverty line, including 15.1% of those under age 18 and 17.4% of those age 65 or over. Bethany, Missouri Facts for Kids. Kiddle Encyclopedia.